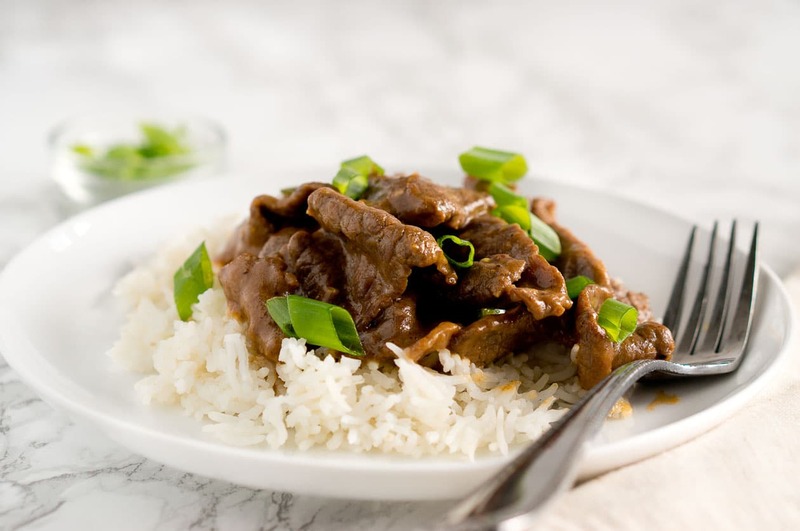 Authentic Mongolian Beef recipe – thin strips of tender beef are lightly coated in cornstarch and cooked in a sweet and tangy soy sauce, garnished with scallions. Despite its name, this dish is actually a Chinese-American classic. 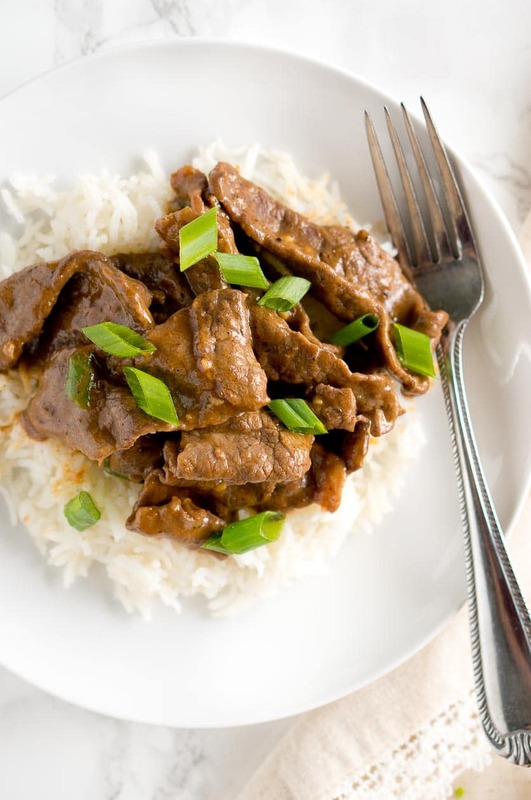 This Easy Mongolian Beef is very quick to prepare – takes only 30 minutes to make, including 20 minutes to marinate the flank steak. So, the actual cook time is only about 5 -10 minutes. It tastes just like P.F. Chang’s Mongolian Beef recipe, except that this one is healthier and made at home with fresher ingredients. If you like your Mongolian Beef spicy, add some red pepper flakes or some dried chilis. If you have a favorite Chinese take-out meal that you wonder how to make healthy and enjoy at home, you have to get this cookbook – The Healthy Wok. Your favorite Chinese food dishes are probably most likely represented in there. Let me introduce you to the author of the cookbook – my friend Charmaine from the wonderful Wok and Skillet blog, where she shares recipes that are a fusion of her Asian roots having been born and raised in Malaysia and her American experience after spending much of her life in the U.S. as well. She focuses on easy, simple recipes with an Asian flair. I was very excited when I received Charmaine’s cookbook The Healthy Wok: Chinese Cookbook for review. 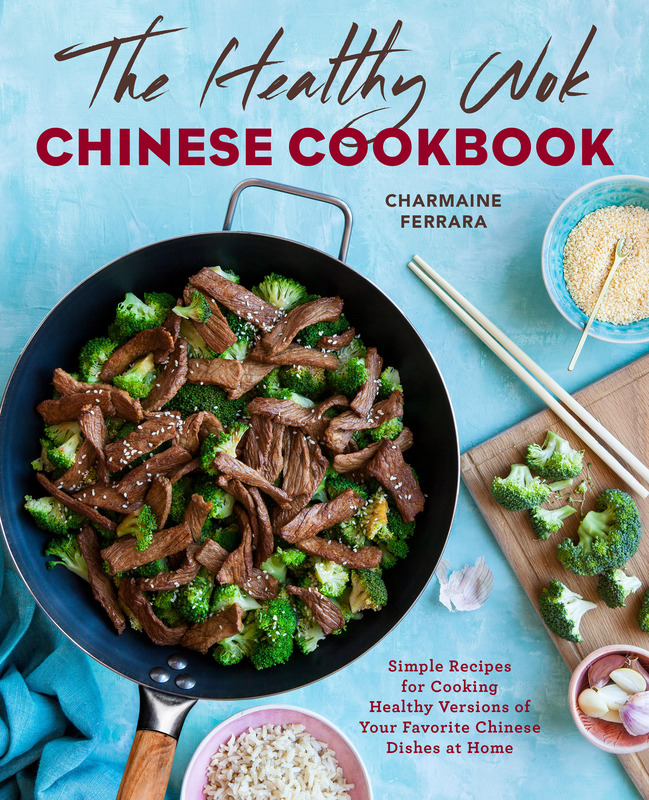 The cookbook is absolutely beautiful with gorgeous pictures of and healthy recipes of some of my favorite Chinese meals – General Tso’s Chicken Stir-Fry, Beef and Broccoli, Sweet and Sour Chicken, Orange Chicken, Kung Pao Shrimp and of course Mongolian Beef. And many, many more well-known Chinese takeout recipes, except that these are made healthy and lighter. Not only are the recipes very easy to prepare but the cookbook also includes measurement conversion (for those who live outside the US) and an introduction to the basics of Chinese cooking at home. This makes it very easy even for a newbie like me in Chinese cuisine to make a delicious dinner in just 30 minutes. All of the 85 recipes are using ingredients that are easily found at your local grocery store. While they may seem intimidating because of their foreign names, the recipes are very easy to make and include easy to follow step-by-step instructions. Chairmaine will show you how easy it is to make your Chinese takeout dishes at home. I got to taste test some of them while I was helping her out during the recipe testing stage. and I can tell you that they don’t compromise on flavor and are easier to make than I imagined. If you make this recipe, let Chairmaine know how much you loved this recipe. 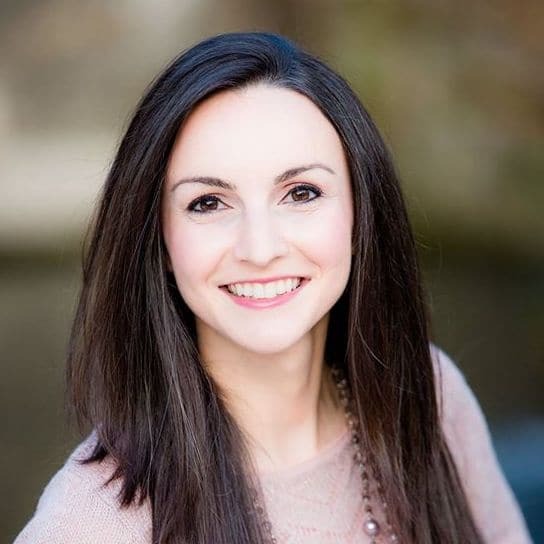 Connect with her on Facebook, Instagram, Pinterest, and Twitter. 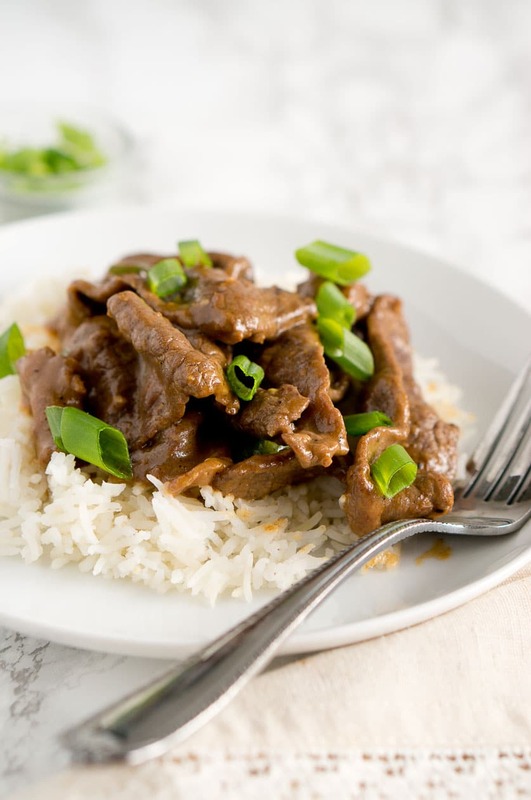 How to Make Paleo Mongolian Beef? You can simply replace cornstarch with arrowroot starch, the soy sauce with coconut aminos and the brown sugar with coconut sugar. A good option to serve with this dish is sauteed or roasted vegetables. I like to serve it over rice (as pictured) with some broccoli. You can also use red peppers, onions, mushrooms, sliced carrots. Yes, you can freeze this dish. I would let it thaw in the fridge overnight before heating. I would heat it on the stove until just warm. you don’t want to overheat it because the beef will get tough. 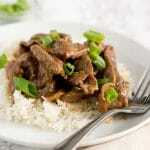 Authentic Mongolian Beef recipe made healthy. It's very easy to prepare and takes only about 5 minutes to cook and 20 minutes to marinate the steak. Sprinkle the cornstarch, salt, and pepper over the beef and toss to combine. Marinate at room temperature for 20 minutes. In a small bowl, prepare the sauce by mixing together the soy sauce, water, brown sugar, and rice vinegar. In a wok over medium-high heat, heat the peanut oil. Add the beef and fry just until the surfaces turn brown. Add the ginger and garlic, and stir-fry until fragrant, 2 or 3 seconds. Add the sauce and stir to coat the beef. Turn off the heat and add the scallions. Give it one last stir to very lightly heat up the scallions but not to cook them. Transfer the dish to a serving plate. If you like your Mongolian beef spicy, add a pinch of red pepper flakes to the sauce. you can also add a few dried red chiles when stir-frying the beef. Quick, simple, delicious… Can only say I’m impressed! Cooking can be so easy sometimes and I love it! Thanks, Diana! 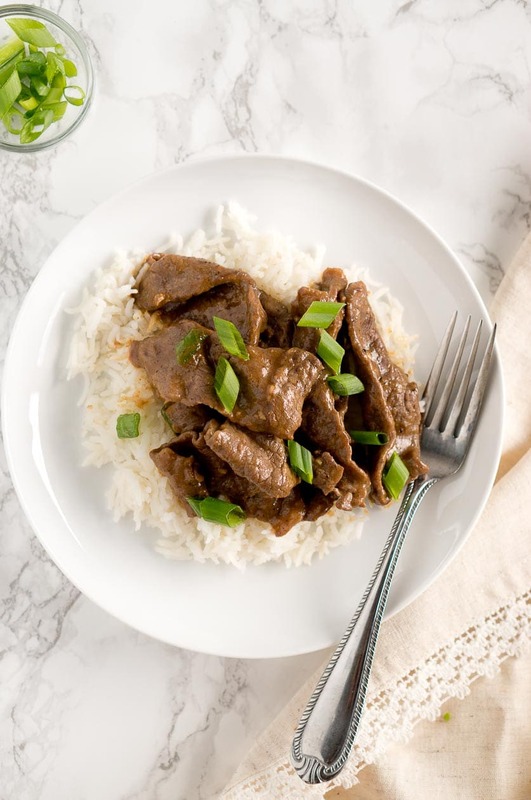 Yes, this Mongolian beef is a quick and delicious dinner! No need for Chinese take out when you can make this at home! Delicious! Perfect for dinner any night! Peanut oil doesnt show up in the ingredients list!!! I had this recipe all planned for today and just noticed in the steps that it says peanut oil. Can i make it with any oil? Hi Jenna, yes, you can make it with any oil, sesame oil works too.